Bajoran Personnel of Human species. When you play this personnel, you may download a Prophet card and/or take each personnel you own that has been removed from the game and place them in your discard pile. "The Sisko has completed his task. ... The Kosst Amojan no longer threatens us." 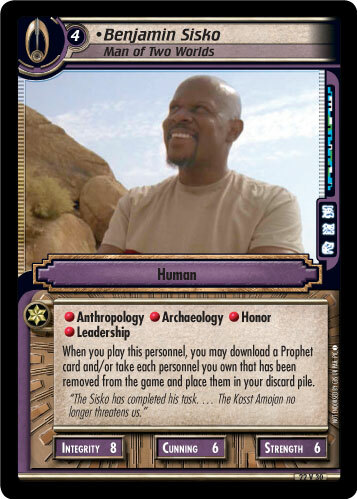 Characteristics: affiliation, "use" your discard pile, download, download - Prophet (cards), recover cards from outside the game, personnel who has a cost of 3 or more, personnel who has a cost of 4 or more, Benjamin Sisko, Human species. Requires: Prophet, remove cards from the game (other cards), remove cards from the game (this card).